The EEOICPA was passed in 2000. It provides compensation to workers who became ill as a result of their employment manufacturing nuclear weapons in the USA, as well as their spouses, children, and grandchildren. Mallinckrodt Chemical Co. Destrehan St. Plant EEOICPA coverage is available for qualified former Workers and their families. Are you eligible for compensation? If you or a family member worked at this or another DOE facility and became ill, you may be entitled to compensation of up to $400K plus medical benefits. Call EEOICPA Counsel Hugh Stephens at 1-855-548-4494 or fill out our free claim evaluation, We can help even if you’ve already filed, even if your claim was denied! Here, we have compiled publicly available information and documentation about the facilities covered by the Act to clarify how their activities relate to the Energy Employees Occupational Illness Compensation Program Act. Facility Description: From 1942 to 1957, Mallinckrodt Chemical Company conducted a variety of milling and recovery operations with uraniumchemical compounds at the St. Louis Downtown Site, also known as the Destrehan Street Plant. The plant refined uranium ore, ultimately producing uranium metal. The activities supported research, development, and production programs for the national defense program. By 1957, the Mallinckrodt Chemical Company had processed more than 45,000 metric tons (50,000 tons) of natural uranium products at its facilities. During closeout of operations in 1957, government-owned buildings were either dismantled or transferred to Mallinckrodt as part of a settlement. Decontamination work continued to 1962 when the plant was released back to Mallinckrodt. This listing of the Mallinckrodt Chemical Works (MCW), is intended to cover the entire area bounded in part by North* Broadway, Angelroot Street, and Salisbury Street. Destrehan Street runs through the middle of the entire area and is a common way to reference the plant, but is by no means the only valid building address. Many buildings are also on Mallinckrodt Street. Coverage includes, but is not limited, to the Main Plant, Plant 4, Plant 6, Plant 6e and Plant 7. *The original address for some buildings would have been Broadway Street. Today, these same buildings have the address of North Broadway Street. Mallinckrodt Chemical Co. Destrehan St. Plant is listed as a Department of Energy (DOE) site under the EEOICPA. As of 08/10/2015, the total compensation paid under Parts B and E of the EEOICPA, including medical compensation, for workers suffering from the effects of having worked at the Mallinckrodt Chemical Co., Destrehan St. Plant is $106,706,053. Click here for a current accounting of compensation paid to former Mallinckrodt Chemical Workers under the EEOICPA. If you or your parent worked at this or any other DOE or AWE facility and became ill, you may be entitled to compensation of up to $400K plus medical benefits from the US Department of Labor. Call EEOICPA Counsel Hugh Stephens at 1-855-EEOICPA (336-4272) or fill out the form to the right, whether or not you have already filed a claim and even if your claim has been accepted or denied. We can help with all OWCP (Federal Workers Compensation) claims, impairments, wage loss and health care. 2495 Main Street, Suite 442 Buffalo, NY. These properties were formerly used in the fabrication of purified uranium compounds and metals from uranium feed materials. All work was carried out under contract with the U.S. Government. Mallinckrodt’s work at plants in St. Louis began in 1942 and continued through 1957, at which time the facilities were shut down for decontamination. This history includes only the work carried out atplants in the St. Louis, Missouri, area and as such does not cover work at Weldon Springs or at other facilities. The initial contract work consisted of the production of uranium trioxide (U03) and uranium dioxide (UO2) to be used in the nuclear pile that was currently being constructed in Chicago. Impure natural feed material containing,low levels of uranium was processed to yield a concentrate of uranium trioxide that could be used for a reactor core. In addition, extra steps allowed the production of uranium dioxide (UO2)and uranium tetrafluoride (UF4). Uranium derby metal also was produced and then vacuum recast to form ingot metal. All of the initial contract work appears to involve 238U, with no process existing for the purification and working of 232Th, highly enriched uranium, UF6, fission products, or by-product material (Fig. 2). 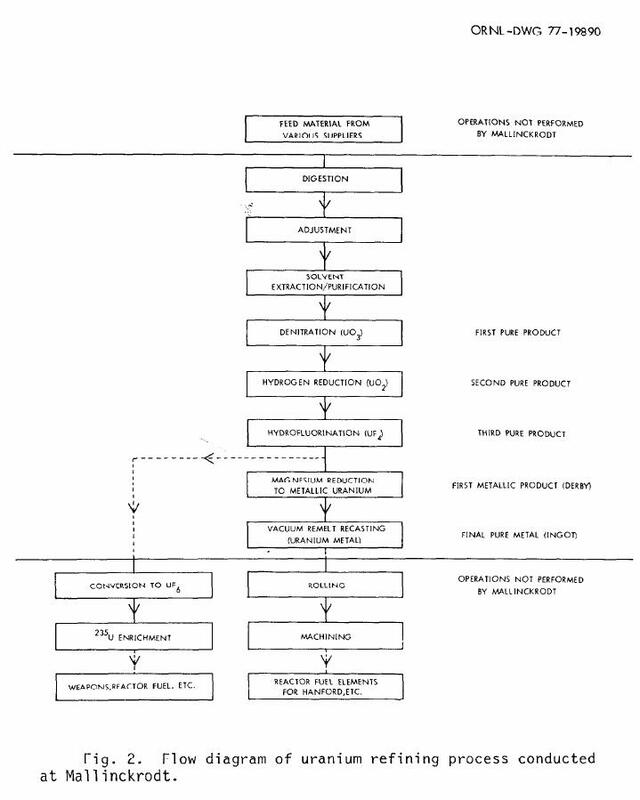 A variety of work processes was carried on at various times during the period 1942 to 1966 including: (1) machining of natural uranium metal rods to make reactor fuel slugs, (2) reverting UF4 to UO2 or to U3O8, (3) recovering scrap uranium metal, (4) producing U02F2, (5) extracting and concentrating 230Th from pitchblende raffinate, and(6) experimentally purifying or reworking very low enrichment UF4. Work was carried on to extract uranium from pitchblende ore and to concentrate this extract. In addition, 226Ra and its daughters were extracted, along with the lead content, since the African Metals Company retained ownership of the radium content of the ore. The radium and lead were precipitated when the pitchblende after dissolution in nitric acid was combined with sulfuric acid. This precipitate was sent to the Lake Ontario Ordnance Works, Lewiston, New York, for storage. Much of this material was moved to facilities operated by National Lead of Ohio, Fernald, Ohio in 1952. Beginning about 1945, process wastes and residues were taken from the St. Louis plants and stored at a government storage site near the St. Louis Airport. During the 24-year period (1942 to 1966), the company designed and operated feed materials facilities in St. Louis and St. Charles County,Missouri, which employed a total of about 3,300 individuals and produced more than 100,000 tons of purified natural uranium materials. The plants in St. Louis, Missouri, were constructed and operated on Mallinckrodt land. In St. Charles County, the land, buildings, and all equipment belonged to the U.S. Government. The contractual work from 1942 to 1947 was carried out under the Manhattan Engineer District (MED) project. This contract was transferred in 1947 to the newly formed AEC and remained under the AEC New York Operations until 1954. At this time, the contract was transferred to the AEC Oak Ridge Operations and remained there until 1966, at which time the contract was terminated. Four plants were in existence during the history of Mallinckrodt’s government contracts. All of the work from 1942 to 1945 was carried out in previously existing structures at the Main Plant and at Plant 4 in the city of St. Louis. The Main Plant was used as a refinery forU308 feed and pitchblende until 1945, at which time these operations were closed. A new refinery called Plant 6 and located at 65 Destrehan in St. Louis began operations in 1946 to process pitchblende ore and produce U02. Additional plants began operating at the Destrehan Street location in the period 1950-51 and went under the names Plant 6E and Plant 7. Plant 6E produced uranium metal while Plant 7 was designed to produce green salt (UF4). Plant 4 operations ended at this time, and its facilities were modified to be used as a metallurgical pilot plant for development work with uranium metal. This operation continued until 1956.